[TOWN WINS! ]BG's Super Smash Bros. Mafia (now with more Ithi)! Welcome one and welcome all to a battle of Nintendo's great mascots! Super Smash Bros! I am your host today, Master Hand, and will be calling the shots and play by play of all the action as it unfolds. Your other host for the evening is Mistress Crazy Hand. This is a very special event for us here as normally the Nintendo mascots get along quite pleasantly. For some reason though, they've recently started going crazy and have been fighting each other. Makes for great entertainment for us though, so we're not complaining! What could possibly cause this to happen? Friends and lovers are at odds and former enemies are helping each other! It's madness. Maybe we will find out. 1. Day 1 will have an undetermined deadline until further notice. After that, Days will be 72 Hours and Nights will be 48 Hrs or until all night actions are recieved. 2. You will not be prodded for activity. If you are inactive without notifying me in some way for longer than 1 full day/night phase, you will be automatically Mod killed if a suitable replacement cannot be found. Be active. 3. Players who are killed off will not be considered for replacements. This will make my job more difficult in finding replacements, yes, but so be it. 4. Please limit game communication to this thread or to the provided methods discussed in your PM. 5. Role Reveals are allowed. Go ahead and mass claim if you want. 6. You may quote me or your role all you want unless you are given a specific message that says otherwise. DO NOT LINK TO YOUR PRIVATE COMMUNCATIONS. You can only quote them. 7. No-lynch, self vote, fair game. 8. If no majority is reached, unspecified bad things will happen. Don't make Master Hand and Crazy Hand angry. 9. All voting and unvoting will be in BOLD RED. 11. This is a hammer game. 12. After you die, you may post a rage/bah post with no game info. A dead thread will exist. 13. This is a game. Everything that occurs in this thread is part of the game. If someone is pushing your buttons, take it as in-game play only. If you find something truly offensive, please PM me and we will work it out behind the scenes with the offender. Keep anything on thread pure game. 15. If you don't like Drunk Mafia or some light-hearted spam, too bad, it isn't against the rules. 16. ADDED RULE: Don't reveal NA's until the Day scene has been posted. Ever. 17. If you feel like gaming the mod, go right ahead. Just don't break the above rules. Everyone should have their PM's now! 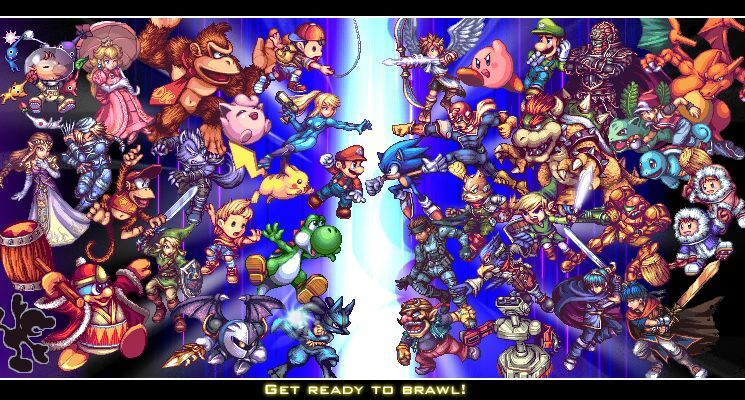 Playable Characters from any and every Smash Bros. game could be represented. Pinned already? Excellent. Also ... Crazy Hand? The left hand to Master Hand's right. The unpredictable Hand I'd say. Cause girl, you craaaaaaazy. *bounces in squishing mushrooms* ...cos that's what they do in these platform type games this is based on right? Extra and even more Ithi. Apparently there can never be enough. My vote counting skillz are legendary. Also I have added the Mobile Voting Code to the OP. If you read it carefully, you will see exactly how it works. A litle note for all llamas - if you change the word "red" to other colours, it will type in other colour too. I have tried it with orange, purple, yellow, green, blue and even hotpink and they all work. Only Red for votes though. Btw BG or Ithi, where's my role pm? why, it's kinda catchy and grows on you, especially the starwars one. Hehe, I did too but when I saw this, it redeemed itself.